Wire Sizing for added generator to Battery backup Gridtied system? Is there a calculator that can help me size the wire needed from the generator to the manual transfer switch? I have a battery backup grid tied system and want to add a generator for a secondary backup to the PV panels, especially if they can't charge the batteries using the panels. The generator I have is a Ryobi 6,500-watt. I figure I can add a manual transfer switch between the generator and SMA Sunny Island and manually switch on the generator when needed if the grid goes down. The wire run will be approximately 35 feet from the generator to the transfer switch. I'm thinking of placing the transfer switch next to the Sunny Island. Assuming you are in the US, then an NEC (national electric code) book is really what you need. You probably need the NEC code book to run it well... There are lots of variables. The conservative number would be to multiply the 27 amps * 1.25 NEC "continuous current" derating = 34 amps (round up to 40 amp standard breaker+wiring). A non-commercial genset will probably not be able to maintain 27 amp output without eventually overheating its wiring/alternator (running hours at 27 amps). Running 1.25x rated wiring is probably "overkill" (you need to decide what your loads will be--If much less than 27 amps, or close too it--especially if you add a larger genset later). Note that most loads are not very large or short term high current (starting well pumps, refrigerators, etc.). However, AC Battery charging can go many hours at maximum rated AC input current (and DC output current) for the AC to DC battery charger... So, for those circuits, you really do want the 1.25x NEC wiring+breaker derating. Otherwise you can get false trips (breakers) or overheated wiring connections (breaker connections, wire nuts, etc.). Or somewhere around 10-8 AWG (ignoring other NEC factors). So, the above 10-8 AWG able (required by code to carry current) is more than heavy enough to carry the current with "acceptable" voltage drop. Thanks for the detailed info. I really appreciate you taking the time to help me. I'll go with the 8 AWG, just incase I upgrade the generator at a future time. Do you have a recommendation for a manual transfer switch. Looking at the wiring I have now, I'll need to bring the AC line from the main panel (where the meter is located) and tie it into the transfer swith with the generator, then take the ouput to the SMA Sunny Island AC2. I should be able to flip the transfer switch when the grid goes down to charge the batteries when the PV panels are lacking because of weather, etc.... .. There are lots of transfer switches out there... From manual, to "simple" relay, to full blown autostart genset controllers. The "simple" AC relay (you power up genset, relay turns on in 6 seconds (or whatever it is)), then you have AC power from genset. Wire the AC battery charger on the "up stream side" of your AC transfer switch (you don't want your AC battery charger pulling power from your off grid AC inverter--that is a bit of waste of energy battery bank using AC battery charger to charge itself). Nice if you have a mix of circuits that you may or may not want to run on genset. Lots of choices out there--In the end, I suggest doing a couple of paper designs and figure out the cost/benefits between the different options. I suggest staying away from "auto start" generator controllers unless you really need that--The more complexity, the more wild and wonderful ways things can fail. I'll be using the generator as a 120V "max power" generator. I want to use the generator with the grid tied SMA SunnyBoy/Sunny Island to charge the 48V battery bank on days the PV panels can't. If I get the https://www.solar-electric.com/pmts-50.html (relay) as Bill has suggested, What other components do I need to purchase besides a 50 Amp Power inlet Box and wiring? Will the PMTS-50 function with the Sunny Island's Digi In? Check how the genset is configured... I.e., 27 amps at 120/240 VAC (split phase) and 54 amps at 120 VAC single phase (i.e., you can parallel the two sets of windings together). Not many genset support that 120 VAC only configuration. The relay I pointed to is powered by the AC line voltage. It sounds like the SMA S. Island has a (12 VDC?) output to control external relay(s)? When you start building bigger systems like--The complexity can be an issue. Make sure you have drawings (yours or from the vendor/installer) that show how everything will be connected and what parts you will need. This requires a fair amount of pre-planning to "get right" the first time. What I like about this forum is that others are doing the same projects as I. am either going to get a ms 4024pae magnum inverter and ac couple it or just use the magnum ms4024AE inverter and charge my batterys with charge controlers. Otherwise I want to do the same project as midijeep. I am interested in getting a reliance controls pro tran transfer switch and wire it into service panel. for the important circuits that are most needed . I also have a transfer switch that you can either get power from grid or generator but not both at same time. It also has a 15 amp ground fault breaker with a 120 volt outlet and a surge suppressor built in. And space left for another 240 volt breaker and single breaker. I plan powering this transfer switch from inverter and installing another breaker and connecting to the pro-tran transfer switch. There is a 240 line from service panel connected to the magnum for battery charging. I can see that the poster wants the ability to use generator to charge his batterys when the solar is low. Since he is grid tied I think he could use the battery charger in the inverter to charge the battery. lots cheaper than using generator. I thank bill and others for ideas about dc water heating and am learning about others posts. When I know or learn more I will post to the post about this subject. Thanks for the info solarvic. I'm going to go over to youtube and see if this will work with my setup. 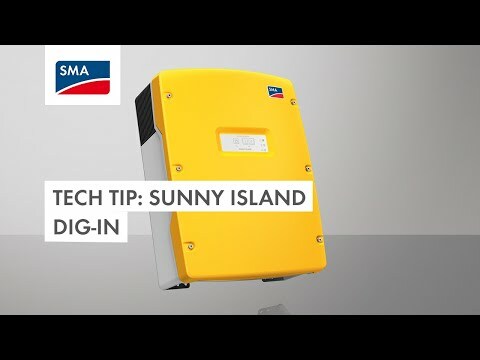 My SMA Sunny Island needs to be connected to a 12ov relay that is connected to the grid. when the grid goes down the Sunny Island will know by the relay switch and has a setting that lets the Sunny Island know if a generator is available when the grid goes down. I'll come back after I watch some videos. Thanks again! I looked at the reliance transfer switches. My only concern is wiring in a 120v relay coming from the the Grid, then wiring the other end to the SMA Sunny Island DIGI IN. Wondering if I can run out of one of the reliance circuit breakers to the 120v relay? if the grid goes down, then the relay will switch and let the Sunny Island know the grid is down and the generator is available? Does this sound right? Anyone have an ideal what would be the best way to connect the 120v relay to the "grid" ? One end of the relay connection would need to go to the Sunny Island DIGI IN and the other end to a 120V source. This would close the relay when the grid goes down. Could I wire in the 120v source to the breaker panel (non-essential panel)?